Since 2013, Chamberlain, the world’s largest manufacturer of garage door openers as well as the parent company of LiftMaster, has provided products with Internet connectivity using its MyQ® technology. Its durable ½ HP motor combined with an industrial-strength chain drive provide smooth and steady performance year after year. Smooth-running reliability is what our enhanced Premium Series delivers – and it's quiet enough not to wake your guests in the bedroom above the garage. Get in your garage every time, even when the power is out. This revolutionary DC belt drive offers quiet operation and comes fully equipped with MyQTM enabled technology and the Timer-to-Close feature. It mounts easily on the wall beside the garage door, the LiftMaster 8500 opener comes with a remote 200‑watt light that can be positioned anywhere in the garage. The optional EverCharge® Standby Power System – that continues to operate your opener even when the power goes out – makes it even more convenient. LiftMaster garage door openers are the world's most popular garage door openers. 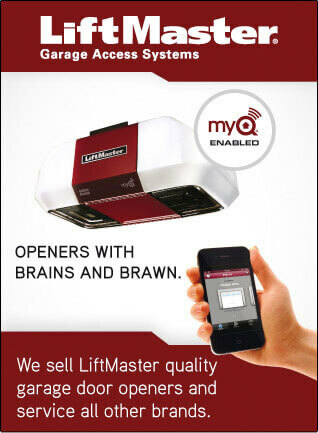 LiftMaster garage door openers offer you reliability and silent operation at very competitive prices. You can use your garage door opener with a keypad to access your garage or with different style of remote control. We have been selling and recommending LiftMaster garage door opener for many years. We service and repair all brands of garage door openers. We carry a large inventory of part and accessories to service you quickly. The MyQ® technology is an intelligent communication system that allows you to access, activate and monitor your garage door opener for greater control and security of your home. The battery backup system allows you to get in your garage any time, even when the power is out. Thank you for submitting your request. Doan’s Overhead Doors will be contacting you shortly.